This 35mm. 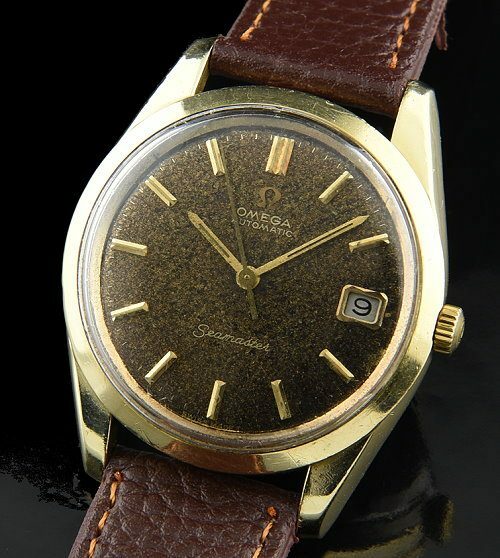 OMEGA automatic dating to 1967 and has a fine gold capped 36mm. case with sea-monster embossed steel back. The correct OMEGA winding crown is installed. The OMEGA caliber 565 automatic movement was cleaned and accurate. This ORIGINAL (once black) dial is simply AMAZING! Look at the colour change-pebble bronze finish…incredible! Try to find another original dial like this! I truly recommend this fine vintage OMEGA. $1595.